Want to be notified of new releases in qvacua/vimr? Project VimR is a (YA) Neovim GUI for macOS. 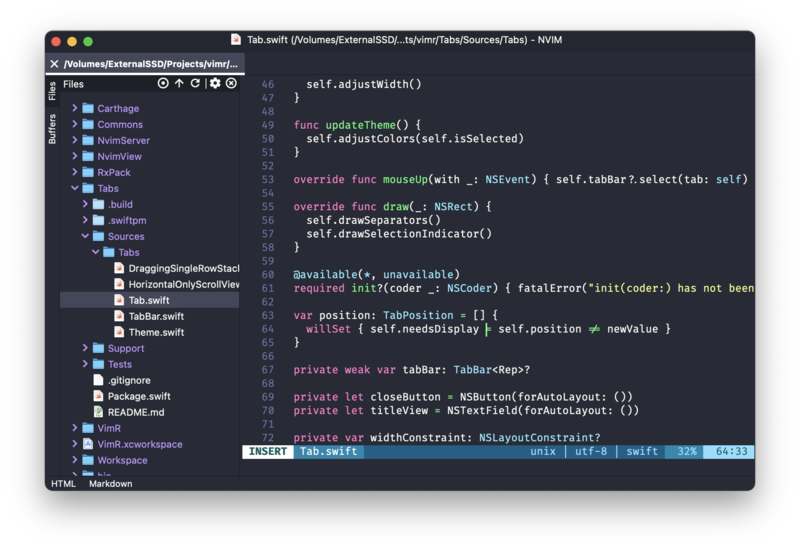 The goal is to build an editor that uses Neovim inside with many of the convenience GUI features similar to those present in modern editors. We mainly use Swift, but also use Objective-C when its C-nature helps. There are other Neovim GUIs for macOS, e.g. NyaoVim, neovim-dot-app, Oni, etc., so why? RxMessagePort: RxSwift wrapper for local and remote CFMessagePort. RxMsgpackRpc: implementation of MsgpackRpc using RxSwift. RxNeovimApi: RxSwift wrapper of Neovim API. NvimView: Cocoa Framework which bundles everything, e.g. Neovim's runtime-files, needed to embed Neovim in a Cocoa App. See the wiki. If you want to support VimR financially, you can use Bountysource. Big thanks to all who did support: We list our spendings in the wiki. Pre-built binaries can be found under Releases. Fuzzy file finder a la Xcode's "Open Quickly..."
Trackpad support: Pinching for zooming and two-finger scrolling. Ligatures: Turned off by default. Turn it on in the Preferences. We will gradually create feature issues with more details. For the current status see the project board. The library libiconv is linked by the linker flag -liconv. The version bundled with macOS will be linked. The library libintl is pre-built in third-party/libintl/lib and linked by "Other Linker Flags" of the NvimServer target. Other libraries used by Neovim, which are automatically built by building libnvim, are linked by "Other Linker Flags" of the NvimServer target. If you are here for VimR-MacVim, use the macvim/master branch and the version 0.8.0 (32).